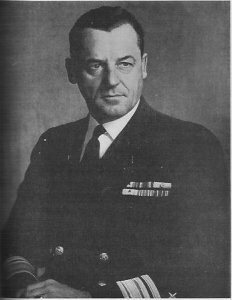 The Pacific War Online Encyclopedia: Chandler, Theodore E.
Theodore Chandler was the grandson of a former U.S. Navy secretary and the son of a rear admiral. He graduated from the Naval Academy in 1915 and served in battleships until 1917 and in destroyers in the First World War. Between the wars, he helped fit out several new ships, attended the Naval Postgraduate School for ordnance studies, and received his first destroyer command in 1929. This was followed by a succession of school and command assignments afloat and ashore. Chandler was captain of the Omaha when that ship encountered the German blockade runner Odenwald in the American security zone in November of 1941. He managed to get a boarding party onto the blockade runner in time to foil an attempt to scuttle her. This was apparently the last occasion on which U.S. sailors received prize money. Chandler was promoted to rear admiral on 3 May 1943. He commanded a cruiser division in the invasion of southern France in July 1944 before being given command of Battleship Division 2 in the Pacific in October. He arrived in the Pacific just in time to participate in the Battle of Surigao Strait during the Philippines invasion. He was described as a quiet, competent, well-liked officer. Chandler was fatally wounded during the Lingayen Gulf invasion, 6 January 1945, when a kamikaze hit his flagship, heavy cruiser Louisville, showering the bridge with burning gasoline. Despite horrible burns, Chandler assisted with fire fighting before accepting medical aid. He died from his injuries the next day, to become the fourth and last American admiral killed in action in the Pacific war.